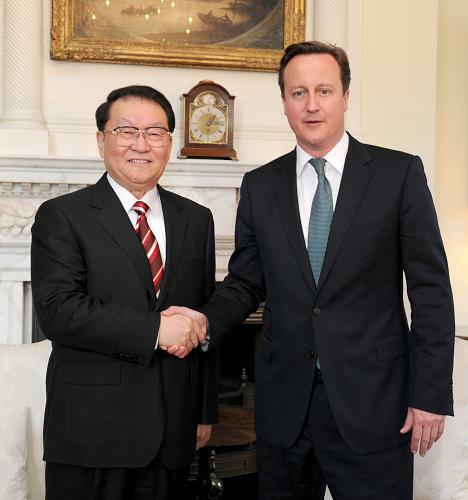 LONDON, April 18 (Xinhua) -- Li Changchun, a senior official of the Communist Party of China (CPC), met here Tuesday with British Prime Minister David Cameron, saying that Sino-British ties generally maintain a good momentum of development. After the establishment of diplomatic relations at ambassadorial level between China and Britain 40 years ago, Li said, bilateral relations have become healthy, stable and mature as strategic mutual trust has kept growing and areas for cooperation have been increasingly expanding. Li, a member of the Standing Committee of the CPC Central Committee's Political Bureau, appreciated the current British government's positive policy towards China. He noted that both China and Britain now face rare development opportunities in advancing ties as both countries are implementing respectively a new five-year development plan. 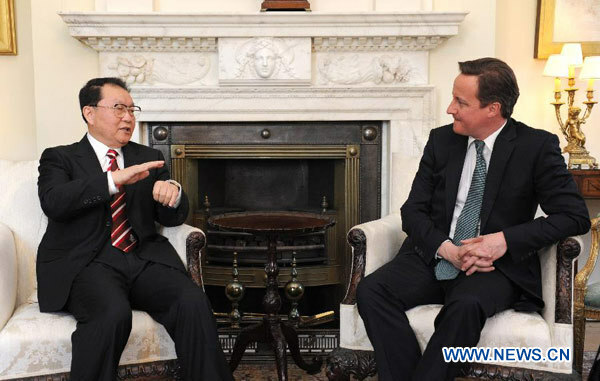 Li put forward a four-point proposal on deepening Sino-British ties. The proposal includes the continuation of grasping the general direction of bilateral relations from a strategic and long-term perspective to boost political mutual trust, and pushing forward the win-win and mutually beneficial economic and trade cooperation to consolidate the economic foundation for bilateral ties. He also called for more coordination between China and Britain in international affairs, and proposed expanded people-to-people exchanges between the two countries. Stressing that inter-party relationship is an important part of the Sino-British comprehensive strategic partnership, Li said the CPC is willing to continue to strengthen exchanges and cooperation with British mainstream parties, including the ruling Conservative Party, so as to promote relations between the two countries. Cameron said Britain has attached great importance to its relationship with China and is willing to further augment high-level exchanges between the two nations. It is particularly important for the two countries to strengthen the economic and trade cooperation under current circumstances, Cameron said, adding that the two sides should fully exploit the complementarity in their economies. He welcomed more Chinese companies to invest in Britain. The British prime minister also lauded the Chinese government's policy of expanding domestic demand to boost economic growth, and expressed support for the European Union to expand its economic and trade ties with China. Li arrived in London on Sunday for a four-day official visit to Britain.